Writer Sandra Boynton wisely deduced that “the greatest tragedies were written by the Greeks and Shakespeare. Neither knew chocolate.” Here in the NEFF kitchen, we can second that notion with confidence, and decided to take it a little further. In fact, we think knowing chocolate should be a compulsory part of the human experience. Think hints of caramel from a darker roast, high-temperature manufacturing processes, sugars and a range of cocoa percentages that bring out the best of the beans, whilst erring further from the bitter world of the dark. Sometimes, the black sheep of the family (or the dark horse in the crowd) is the most beautiful. For a timeless choice of indulgence, dark chocolate still stands as the elegant queen of the cocoa world. 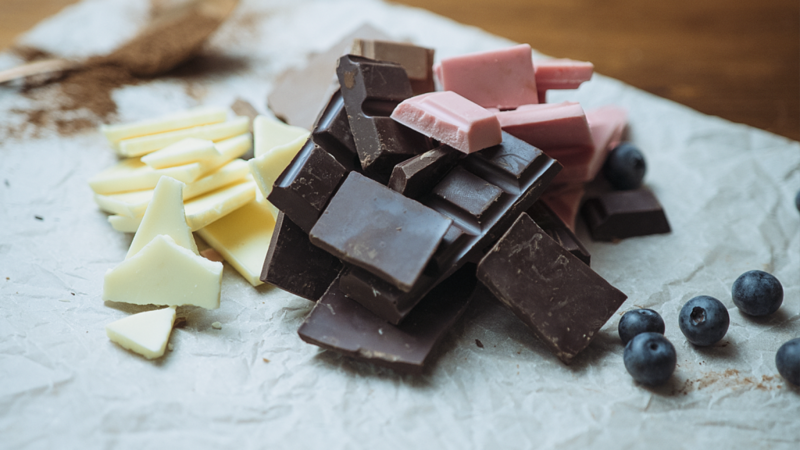 Made without any milk additives (and often very little sugar), dark chocolates have high cocoa content and help bring out the best of the beans’ natural complexity. Higher cocoa percentages often result in fruity, bitter notes and a heavier texture, while lighter versions are delectably smooth and sophisticated. Perfect for wine pairings and indulgent recipes like a Chocolate Crème Brulee or Chocolate Peppermint Tart. Cocoa isn’t just about the beans. Cocoa butter (extracted from the seed with a heavy-duty cocoa press) is a creamy and delightfully rich offering from mother nature. When combined with sugars, spices, flavours and milk fats, this cocoa butter is the foundation of white chocolate – perfect for fruity desserts and a sweeter tooth. The innovative era of chocolate making isn’t over yet. While we’ve been devouring blocks of milk, dark and white, the world of chocolate has taken a more colourful turn. In September 2017, scientists and chocolatiers (led by Barry Callebaut) released this rosy delight, aptly named “Ruby”, and already it is taking the food world by storm. After discovering a new pink bean in the cocoa-growing regions of Ivory Coast, Ecuador and Brazil, teams have been hard at work for 13 years to bring the berry-laced, indulgently smooth creation to market. Not to be confused with white chocolate mixed with food colouring, Ruby chocolate has a sweetness all of its own. Keep an eye out for this innovation in chocolate and be one of the first to work it into your recipes when it reaches Australian shores.